The next time you pound on a table to make your point or are told to take your elbows off a table for the sake of good manners, pause for a moment to respectfully consider that table. It may be constructed of the latest modern plastic or it could be a fine heritage piece crafted two centuries ago. Either way, the table we take for granted is as necessary a piece of furniture as any you will find. My mother would agree wholeheartedly with that. In her living room alone, she has eight tables. It would be hard to imagine life without the table. We use it to eat, to entertain, to hold lamps and to display objects. Imagine the immense stacks of things that would surround us without the trusty table. It is not surprising, then, that its history dates back as far as anything that survives today. A lot of the fun of collecting old furniture lies in discovering the history contained in a piece. The design is a snapshot of the artistic and social trends that were in vogue at the time of its construction. Styles evolved one from another in what is frequently a predictable pattern. The history of design, for example, is full of trends that alternated between the ornate and the conservative. This applied to costume, architecture and certainly to furniture. It was no accident that the high-spirited excesses of the Baroque and Rococo styles gave way to the orderly, restrained Neo-Classic taste that reigned supreme in Europe at the end of the 18th century. By design, the table is very functional. After all, what could be simpler? Two, three or four legs topped with a flat surface. It is sturdy and offers a good amount of usable space for its size. It was these characteristics that made the table so adaptable to ornament and changing tastes. The concept of a table has almost certainly been around since man first lived in fixed surroundings. The Egyptians favored dark and durable ebony wood for their tables. The Greeks and Romans used lighter coloured, soft woods such as pine and beech to construct small tables that looked like stools. They seem to have been used for eating and gambling, an early example of putting your money where your mouth is. Those soft woods were susceptible to insects, dampness and general wear which is why there are no surviving tables of the period save a few in marble. In China, tables were used before the 1st century AD. Tables are mentioned in the Bible. In Europe, the table was in use by 400 AD. Naturally, not much is known about its development between 500 and 1000, but then the Dark Ages are not remembered as a time of painstaking historical record. Some paintings and art of the period have survived, enough to let us know that tables were not used for storage during this time. In fact, the table that most people were acquainted with was probably the all-purpose bench. In modern times, it was not until the time of the European Renaissance that the design of the table would at last reflect the needs and status of its owner. Those changes came about with the establishment of royal courts. The royal court came into being when things settled down politically in Europe. Gone finally were the years when the nobility was frequently away from home fighting a war. With more peaceful times came more leisure. With fewer wars, there was more money to spend. And what better to spend money on than the time-honoured symbols of wealth for royalty and nobility alike: a fine house and expensive furnishings. The tables that now reside in museums and private collections were not typical of the furnishings of everyday life. They were the best of what was made at the time. Otherwise, they would not have been cherished and cared for so that they could end up in a museum hundreds of years later. Then, as now, most people could not afford such grand furniture. The lower classes had no choice but to make do with roughly constructed, utilitarian furniture that wore out from heavy use long before it could be transported to a museum. It would be interesting to see some of these everyday tables, but they would never compare aesthetically with the furniture of the fashionable that we have become accustomed to seeing. Only the rich could afford to pay for the finest in materials and craftsmanship and could afford to commission new pieces as styles changed. The first specialty tables were developed specifically for writing in the Italian palaces of Florence and Rome. This marked the first great period of furniture ornamentation in history. The Italians were connected through trade with the Far East and the Arabic world. From these associations arose a passion for Oriental decoration and exotic inlays of wood and the popularity of the abstract Muslim arabesque pattern. This design motif is used by the Muslims since their religion does not allow imagery depicting animals or people. As the Renaissance spread throughout Europe, these design influences also spread. Soon after, dining tables replaced the earlier trestle and board arrangement. The courts of Louis XIV and XV in France were inspiration for many small, decorative tables and desks. In the elaborate atmosphere of the French court, the writing table, the night table, the dressing table, the occasional table and the tea table were devised. 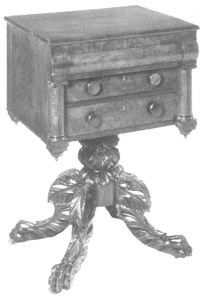 Despite its similarity in name, the French night table was very different from our own. Its main feature was a shelf to hold the chamber pot, which was commonly used at night. The tea table was a direct result of world history. The introduction of tea to Europe happened after trading with the Orient began--a practice that became increasingly lucrative for European merchants in the 16th and 17th centuries as the personal wealth of the landed class began to rise. There was a growing market for spices, tea, ceramics and the exotic woods of the East. These new woods were perfect for use in the new tables. Craftsmen were already experienced in carving walnut and oak, the native timbers. It was easy enough to transfer this skill to the harder woods such as ebony, zebra, rosewood and mahogany. By the 17th century, the era of grand palaces and palatial royal homes was underway. One of the grandest, and the one that would influence the Western design world the most, was the Chateau de Versailles built by Louis XIV of France. He was known as the Sun King because all that was important was said to radiate from him like energy from the sun. This was a bit of arrogance that would dog his offspring a century later in the French Revolution. Versailles was built in the second half of the 17th century. It was opulent, enormous and furnished within an inch of its life. So big were the rooms that the court architect inherited the task of furnishing them so that the furniture would be constructed to a suitable scale. In the homes of the wealthy, there were three main types of functional table by this time: a large dining table, a smaller table for writing or dining, and a folding table. The console table is said to have been developed at this time to fill in an alcove at Versailles. The console stands against a wall (sometimes it can be attached). It was an innovative design solution. In the smaller private apartments within palaces, royalty and their entourage could live a more scaled-down life, though this would have been a curious way to describe their circumstances according to the truly poor who fell under their jurisdiction. Smaller tables with drawers for the bedside, side and serving tables for intimate dining, and wine and games tables for recreation all were developed for these smaller residences. In England, the progression of royal life was not so seamless as in France. Charles I was beheaded by Puritan revolutionaries in 1649. Needless to say, during their 11-year reign, the design arts did not show much advancement. Functional and uncarved were the politically correct prerequisites for any tables built during this time. Luckily for those who longed for the fancier life, royalty was restored to the throne with Charles II in 1660, and this ushered in a period of unabashed decorative freedom courtesy of contact with continental Europe. The rise of the Baroque style in Italy emphasized style over form, and a whole generation of ornate tables, which could combine marble, gold, gilt, carving and extravagant sculpture in one creation, was born. The art of veneering had been mastered in Holland, and this became the hot design trend in the rest of Europe. It was especially suited to combining the new influx of expensive, decorative woods from colonies around the world with less expensive, native woods to produce tables of great artistry. The arrival of the 1700s brought greater quality rather than incredible variety to the table. The stretcher, a horizontal piece that spanned two or more legs, had served as visual weight in the heavier tables of the 1600s and was now dropped altogether. This visually lightened a piece and gave it a more elegant look. Veneering and lacquering remained popular and the Rococo style of asymmetrical decor developed. It featured forms taken from nature such as shells and foliage. Though not functionally necessary to a table, Rococo was still much lighter in feel than Baroque had been. In France, the table en chiffonière was conceived as a work table. The table à ouvrage was developed specifically for needlework. Thomas Chippendale's design book The Gentleman and Cabinetmaker's Directory, with more than 200 designs, was published in 1754 in London. Many of the designs were for tables. The book was an instant success and was an especially big influence on furniture craftsmen in the isolated Canadian and American colonies, where design was still in its infancy. Colonists typically used either tables brought with them from England or Europe or constructed rough hewn ones from frontier materials on their arrival. There was a considerable design lag of up to four decades between the styles of Europe and those of the colonies. By the time of American independence in 1776, though, there was a new generation of craftsman emerging. Still influenced strongly by Europe, this new type of designer was daring enough to develop styles with their own character. By the beginning of the 19th century, there were important furniture design centres established in Philadelphia, New England and New York. With the American Revolution and the migration of Loyalists north to Canada, these influences spread even further. The Faneuil Family Queen Anne concertina-action cardtable with inlaid mahogany and crewlwork playing surface (inside). French-Canadian tables in what was then New France, today Quebec, obviously derived much of their inspiration from the country the colonists had left behind. Yet, not many could afford to transport their furniture across the ocean from France, so a native furniture industry sprang up to provide for the growing needs of the colony. The domestic furniture was built on a much bigger scale than what the colonists had left behind. It was sturdy, usually much simpler, and carved and decorated from solid wood. The people of New France did not seem to possess the long tables that French peasants had in their homes at the time. Perhaps this was because of space considerations. Certainly, a home to resist the rigours of the Canadian climate was not as easy to build as one for a more moderate climate such as France's. Folding tables, called tables pliantes, were popular because they could be folded and placed against a wall between meals. Pine, birch and butternut were the woods used most in Quebec furniture. A tabletop usually had three large pine boards with a molding at the edges. Another popular piece was the table-chair, table à bascule, with a round or square top that could be lifted to form the back of a chair. In late-18th century English Canada, the traditions of tablemaking were either American, via the Loyalists, or British. The principal wood used was mahogany, as in England, with a secondary wood of pine underlying the veneers. Thomas Chippendale's designs were still popular though the simpler Neo-Classic style of Hepplewhite and Sheraton was trickling in as well. In Nova Scotia, the design influence was a combination of the resident French settlers, called Acadians, American Loyalists, and the new British settlers who came in from Scotland and England. The British deported 6,000 Acadians in 1755 for their refusal to take oath to the British Crown. Their homes and belongings were burned, though a few things survived. Their chairs, for example, had very low seats since the Acadians were shorter than the English. The establishment of Halifax was the push that fine furniture craftsmen needed to become profitable. With its wealthy officers and merchants, the new settlement was able to attract highly skilled craftsmen. Before this, tables had been very plain, produced for the farmers and fishermen in the area. By 1820, the supply of pine had been cut, so craftsmen turned to black birch ("poor man's mahogany") and curly maple to produce their carefully crafted tables. Drop-leaf tables were popular throughout the Eastern U.S. and Canada, especially in the countryside where their space-saving nature was appreciated in small homes. In New Brunswick there was an influx of highly trained British apprentices after the War of 1812. One of these was Thomas Nisbet who arrived in 1813. In the book Antique Furniture by New Brunswick Craftsmen by Huia Ryder, Nisbet is called the "Duncan Phyfe of New Brunswick," referring to the renowned New York cabinetmaker of the period. Nisbet was known for his spiral-twisted table legs. Farther west in Upper Canada, now Ontario, life was generally rougher except in the communities of Niagara and York. Tables were said to resemble chopping blocks by those traveling through the region in the 1820s. At the same time, new settlers from Britain were advised not to bring any of their furniture with them because of the high cost of shipping. Back in Europe, the Neo-Classic movement was still strong. It is now known variously as Empire in France and Regency in England. After the French Revolution in the 1790s, the furniture of the aristocracy had been sold all over Europe, and these exquisite creations served as models for craftsmen far and wide. Excavations in Egypt and the Middle East led to tables with sphinx legs, massive paw feet and decorative Arabic work. The imaginative triumphs of the period led directly into the dreary years of the Victorian revivals. Tudor, Gothic and Rococo styles all reappeared, especially in England. One interesting development was the use of papier-mache for English furniture. 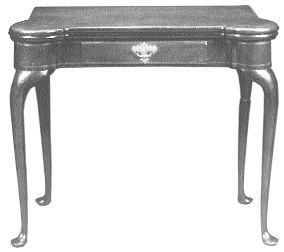 In the U.S. tables were shown with cast iron legs, a very exciting departure. The Arts & Crafts Movement and Art Nouveau closed out the century. They contributed exotic themes, a return to individual craftsmanship, and a focus on nature to table design. Since the end of the last century, the design world has witnessed a riot of styles and materials for tables. 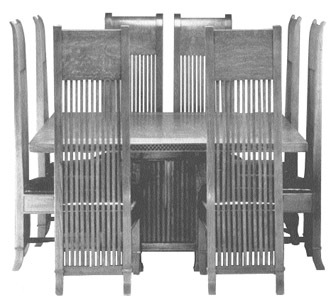 Some of the most talented designers were Charles Rennie Mackintosh from Scotland, Frank Lloyd Wright from the U.S., and Josef Hoffmann from Austria. These three contributed their legacy of clean, straight-lined tables to the world. The Art Deco movement of the 1920s and 1930s delighted in geometric shapes and cold materials such as steel and chrome. The biggest material of the century has been the rise of plastic for table construction. Some designers used it exclusively. Some of the tables of the past remain popular because their designs were so well conceived. Georgian, Neo-Classic and Louis XV reproductions continue to sell. Few of us will ever own an original table from that period, but at least we know that a good copy can be found. Only 1000 years ago, the average person would have been lucky to own a table. How things have changed!